This study closed in July 2016 to new participants. Thank you to all who took part. IAN Research is now delving deeper into the elopement and wandering patterns of children and dependent adults with autism, and looking at the prevention strategies that caregivers implement, in our Elopement Patterns and Caregiver Strategies Research Study. Eligibility does not require a history of elopement and we encourage all families to participate. Those who complete the survey will be entered into a drawing for one of ten $100 Amazon gift cards. Depending on history of elopement, the survey will take between 10 and 30 minutes to complete. The survey may be completed in more than one sitting. You can find this questionnaire, and others, listed in your IAN Family Profile under the name of your child with ASD. To access your profile, log in to IANresearch.org. While you are there, be sure to complete other important surveys, such as the Birth and Diagnosis Questionnaire and the School Services Questionnaire. You can find this questionnaire, and others, listed in your IAN Family Profile under the name of your child with ASD. To access your profile, log in to IANresearch.org. Not an IAN Research participant and want to participate? If you have a child with ASD (under 18) or you are the legally authorized representative of an individual with ASD 18 or older, please join IAN Research and complete your Family Profile. Surveys appropriate for each family member, including the Elopement Patterns and Caregiver Strategies Survey, will appear under family member names. 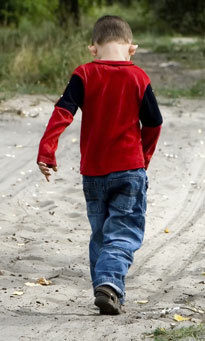 IAN Research also welcomes independent adults with ASD. Thank you to all who participate in IAN Research. Your involvement leads to discovery. Together we can provide information and support to improve policy and programs to support individuals and families affected by autism. IAN’s Research Manager, Dr. Alison Marvin, can be reached at 443-923-4143, 866-348-3440 (toll free), or researchteam@IANproject.org. Interactive Autism Network (IAN) Research Project at Kennedy Krieger Institute (Johns Hopkins Medicine IRB #: NA_00002750). Principal Investigator: Dr. Paul H. Lipkin. Anderson, C., Law, J.K., Daniels, A., Rice, C., Mandell, D.S., Hagopian, L. & Law, P. (2012). Occurrence and family impact of elopement in children with autism spectrum disorder. Pediatrics, 130(5):870-877.